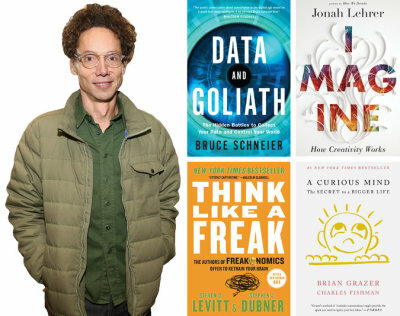 Above: Malcolm Gladwell, the best-selling author of The Tipping Point, and some of the book covers that feature his blurbs. “I feel like we have to promote ourselves,” he said of endorsing other writers’ work. Here is a brief excerpt from an article by Laura M. Holson for The New York Times. To read the complete article, check out others, and obtain subscription information, please click here. When Malcolm Gladwell was asked to write a blurb for the 2005 book Freakonomics, he did not explain that it explored the dynamics of the Ku Klux Klan or the impact of naming a child “Loser.” Instead, the New Yorker writer and best-selling author of The Tipping Point and Blink simply wrote, “Prepare to be dazzled.” Freakonomics became a best seller. And a decade later, Mr. Gladwell’s name adorns scores of book covers not his own. He has praised tomes by celebrity restaurateurs (Dan Barber of Blue Hill), Academy Award-winning movie producers (Brian Grazer), first-time novelists (Stephanie Clifford of The New York Times), hybrid writer-artists (Lauren Redniss) and more. It’s hardly news that when it comes to selling books, blurbs from even famous people are of dubious value. “I discourage writers from doing them,” said Mort Janklow, the longtime literary agent whose firm once represented Mr. Gladwell. Is it possible that Mr. Gladwell has been spreading the love a bit too thinly? Laura M. Holson is an award-winning multimedia journalist for The New York Times focusing on personality profiles and narrative storytelling. For the past two decades, Holson has been exploring the intersection of money, power and celebrity in Silicon Valley, New York, and Hollywood. To learn more about her and her work, please click here.